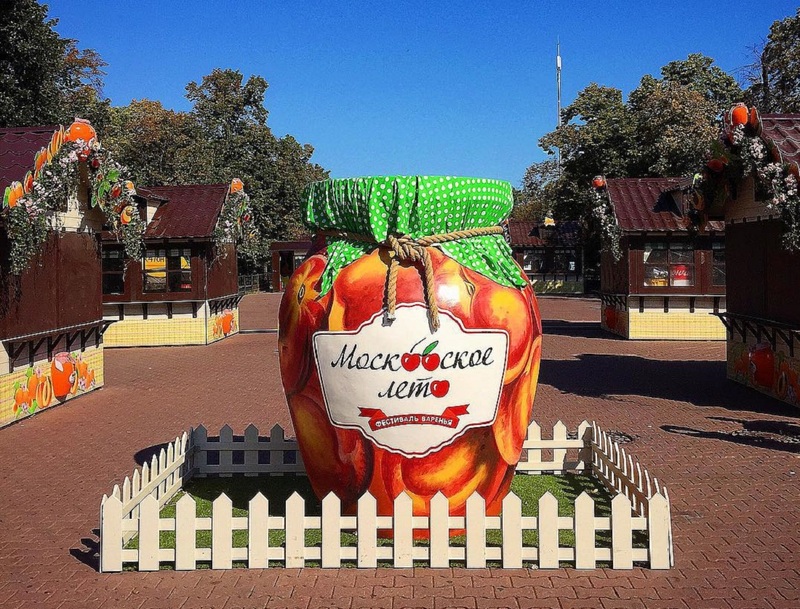 Giant jam jars, a huge watermelon, animal figures, made from real fruits and vegetables have appeared throughout the city center within the Moscow Summer Jam Festival that will be held in Moscow from August 13 to 23. Giant jam jars with the Moscow Summer inscription, which appeared in large numbers at Moscow boulevards and squares, are brand elements of the festival. This year, installations are very divertive – ones are made from plastic, others from glued fruits and vegetables. As reported, such ‘fresh’ installations are covered with a special varnish, which should prevent them from rotting. The event will take place on the Arbat Street, Revolution Square, the Krimskaya Embankment, Tverskaya and Manezhnaya Square, and many other places. The Manezhnaya Square will become the min venue of the festival. There, a huge watermelon ark was installed along with the stage and other art objects. Residents from different countries and 40 regions of Russia will sell their production at traditional chalet-tents that are used in the city for such festivals. There will be more than a thousand events, including workshops, concerts, performances and so on. The festival will cover the entire city center. Moscow parks, squares, avenues and pedestrian streets will become venues for the festival.